Ever since the popularity of golf spiked in the 1990s, there have been more women on the fairways and greens than ever before. Many women who took up the game then now find themselves enjoying the bliss of grandparenthood and a more relaxed schedule with full-time employment behind them. For many such women who retire to a community with one or more courses, joining an established women’s golf association is a natural portal to improving their games and making new friends. But, in addition to personal health benefits and social networking, being a member of their club’s all-female golf group also makes them a part of our nation’s gender equality movement. It may be hard to imagine today, but there was once a time in the not-too-distant past when women golfers at both public courses and private clubs were limited to less desirable tee times and permitted to hold events only so long as they didn’t conflict with the men’s schedule. Women’s golf associations formed to pool their numbers and clout to do away with those “traditions,” thus putting the game on an equal footing for all. The result has been gender parity at nearly all private clubs and a legacy that future female players will hopefully appreciate. Thus, in communities large and small across the nation, women’s golf associations continue to be an important quality-of-life asset, creating new connections and dispensing with outdated norms. The Landings is a sprawling Georgia retirement and residential community that covers much of the high ground on Skidaway Island, located just east of historic downtown Savannah. Among the more than 8,000 homeowners are young families just starting out, multi-generational households, and retirees from most states in the union, plus a number of foreign countries. Golf is the featured recreational amenity at The Landings, as might be expected in a community with six on-site championship courses crafted by some of the game’s most gifted designers. 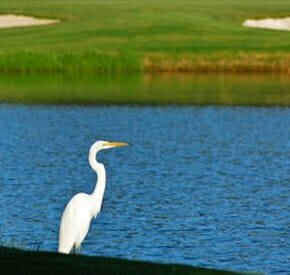 The Landings Club is the membership association for community residents who play those scenic layouts and is home to the largest women’s golf association among all private country clubs in America. Founded in 1974 and with a current membership of around 450, the Landings Women’s Golf Association (LWGA) has provided a model to be emulated by scores of similar groups, especially in establishing that all-important standard of equal course access. Women’s golf at The Landings Club employs a three-tier approach. The informal “Farm Team” program is designed for women who are new to the game or maybe only played a few times a year before retiring. Staff professionals at the club offer instructional classes and players are grouped with those of similar skills for low-pressure rounds. The Landings Nine-Hole Women’s Golf Association (L9GA) is the next step for former “Farm Team” players and new residents for whom a Thursday morning half-round of fun competition best suits their schedules. Members of the LWGA are lower-handicap golfers who often fill up two of the Landing’s courses for their Tuesday morning flighted tournaments, among other monthly competitive events. And a “buddy system” gets newbies at each level right into the swing of things. In addition to social events like luncheons and dinner dances, both of the women’s golf groups at The Landings serve as conduits to volunteer opportunities and fund raising for local charities. The L9GA sponsors a big tournament every October that’s open to all club members—even men—and raises money for the Kid’s Cafe, an after-school meal program for children in the Savannah area at risk of hunger. The LWGA has raised more than $700,000 in the past 13 years for cancer research with their annual Golfing for a Cure Tournament, while smaller events benefit local military families in need, the Second Harvest Food Pantry, and the holiday-season Empty Stocking Fund. 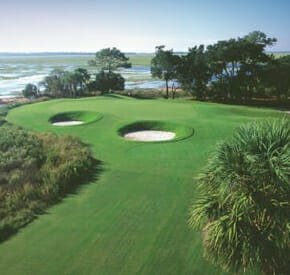 Located just up the coast in the South Carolina Lowcountry near the historic town of Beaufort, Dataw Island is a private residential and retirement community smaller in size than The Landings, but second to none in the quality of its golf. Both of the Dataw courses—Tom Fazio’s Cotton Dike and Arthur Hills’ Morgan River—are award-winning designs that have been recently renovated and have hosted numerous sanctioned amateur tournaments. While Dataw Island Club members enjoy a variety of top-flight amenities, the Dataw Tennis Center was named in 2017 by the U.S. Tennis Association as one of the top four facilities in the country—golf is the most popular outdoor recreation. The club’s flexible membership structure and access policies have certainly contributed to that growth in women’s golf participation. Dataw offers “al la carte” cafeteria-style membership plans that are renewable on an annual basis, allowing members to expand or change their choices as their lifestyles, interests, and schedules evolve. All members, regardless of plan, have access to the club’s golf practice facilities, can take part in free instructional clinics designed for new players, and may tee it up on the courses six times a year before joining a golf membership program. “This approach allows future golf members to get their feet wet before fully diving in,” Britton said. Women golfers at Dataw Island Club, like their counterparts at The Landings Club, can then either move on after a learning period or jump right in to one of two golf groups. Or, like Celeste Nalwasky, a past president of the Dataw Island Women’s Golf Association (DIWGA), they can participate in both the 18-hole and nine-hole groups. She helps to coach new players and enjoys the casual fun of nine-hole outings but keeps her low-handicap skills sharp by playing in most of the competitive 18-hole tournaments. “We were all beginners once,” said Nalwasky. “Golf is a fantastic way to get connected and to stay active.” Making a positive contribution to the local community is one way to establish those links: Among other charities it supports, the DIWGA recently raised more than $12,000 for cancer research at a single event.